The Israel Bootcamp is supported by a collaboration between Austrade and Bridge Hub. 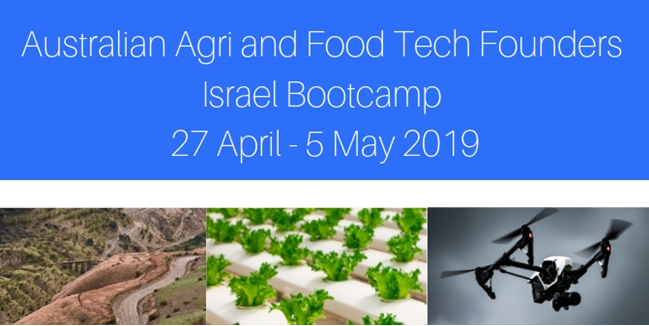 Together we aim to expose Australia’s leading agri and food tech founders to global opportunities and knowledge through an intensive boot camp program in Israel. Do you know any Australian Agri or Food Tech startups that should apply? WHO: Up to 10 Australian agri and food tech startup founders looking to scale globally. WHAT: The program will be curated by Austrade’s Landing Pad in Tel Aviv and Bridge Hub. The program will include events, information sessions and opportunities to better understand how to take your startup global. Subsidised flights, accommodation, transfers and some meals will be organised as part of the program. WHY: Israel is known as the Startup Nation with over 6000 startups. Their startups are born global and the ecosystem is supported through connections with over 350 multinational company R&D headquarters, government programs and established VCs. Israel is also a global leader in agri and food technology especially in the areas of robotics, sensors, drones and alternative protein sources. Applications close 28 Feb 2019.